If you, as I do, believe in the benefits of cathartic violence, then you’ll be no stranger to the wondrous world of war-based game-play, in which as the gamer, you’re able to maim, torture and kill indiscriminately yet still prevail as the hero. It’s sweet stress-release in its purest form and the evidence in which naysayers claim that game-based violence leads to real-world psychopaths is scant, at best. However, if the snowflakes of this world really need to voice their concerns, then perhaps they’d be more willing to go along with a tale almost as old as time and as culturally significant as both the Bible and the complete works of William Shakespeare. 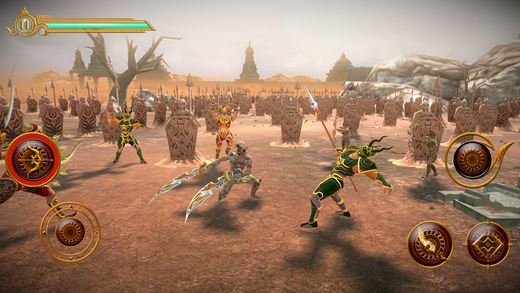 Mahābhārata is an ancient 200, 000+ verse Sanskrit text that has been brought to 3D-life in the epic new mobile action adventure game, Legend of AbhiManYu by ACY Entertainment. Mahābhārata is the war to end all wars, so much so that the onlooking gods’ begin to stress a bit about the magnitude of the battle and set about a plan to finish the war once and for all. Varchas (son of the moon god Chandradev) is sent down to earth to be born in human form to the best warlord around, Arjuna. AbhiManYu (as Varchas is now going by) is born with a complete knowledge of the intricate defense structure of Chakravyūha (a multi-tiered defensive formation that looks like a blooming lotus when viewed from above) and an innate talent for both archery and swordsmanship. It is these skills that make him uniquely capable of defeating the Kaurava (enemy) army. As you might expect, as the game progresses each level becomes more intricate and increasingly difficult to complete. You’ll come across archers, sword soldiers, spear soldiers, sword generals, mace soldiers and boss villains equipped with supernatural powers. Whilst you’re defeating all these bad boys, you’ll also be required to crack the puzzle-like war formations of Chakravyūha, such as trident, circular, wing, wave, wheel and octopus. 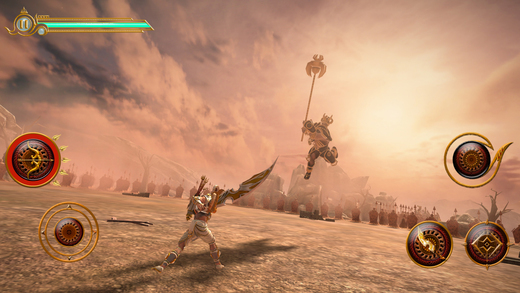 Legend of AbhiManYu (LoA) requires 10.0 or later to function and is compatible with iPhone, iPad and iPod touch. If killing is your fancy, then LoA is your game and well worth a punt for any wound up peeps out there, who are looking to blow off a little steam. So what are you waiting for, spear, stab and kill your way to spiritual harmony by downloading Legend of AbhiManYu from the App Store today!